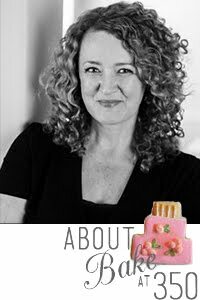 A friend, let's call her Cheryl, tells you about making desserts in push-pop containers. You then see a blog post about them. You decide that you MUST have these containers, and NOW. So, you buy a case (yes, a case), of them....where they sit in your guest room closet for almost a year. I guess I needed a little push, so to speak, to use my push-pop containers and that came by way of Courtney Dial Whitmore's book, Push-up Pops. While this project isn't in Courtney's book, I used many of her push-pop tips...and seeing her creations gave me the kick in the pants I needed to get started. 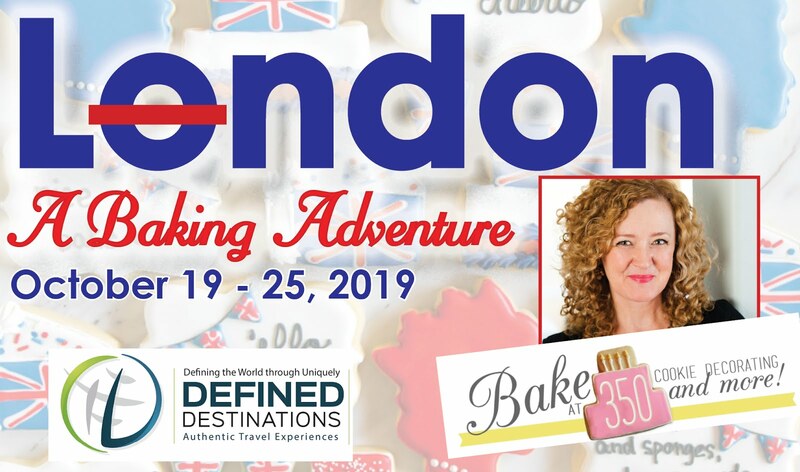 First, bake your cake. I used a chocolate cake mix here. (Go ahead, judge if you must.) 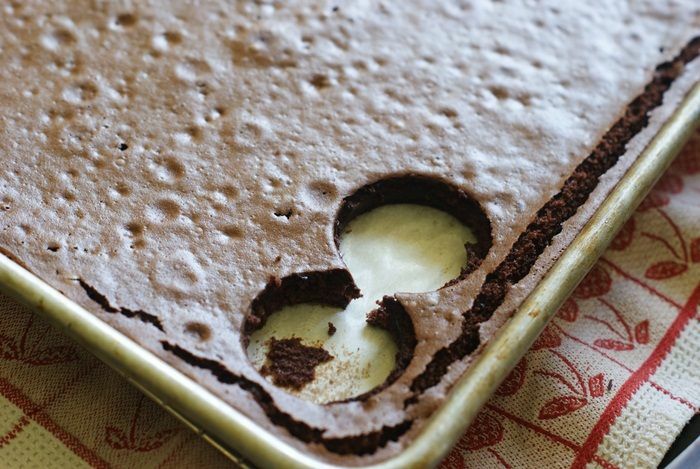 You'll want to bake your cake in a jellyroll or half sheet pan. Bake and let it cool. 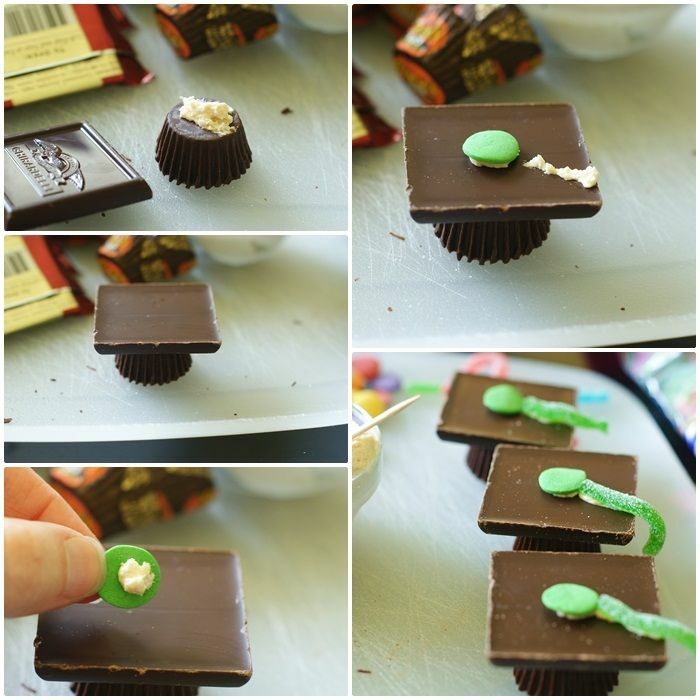 While the cake is cooling, make the graduation caps. 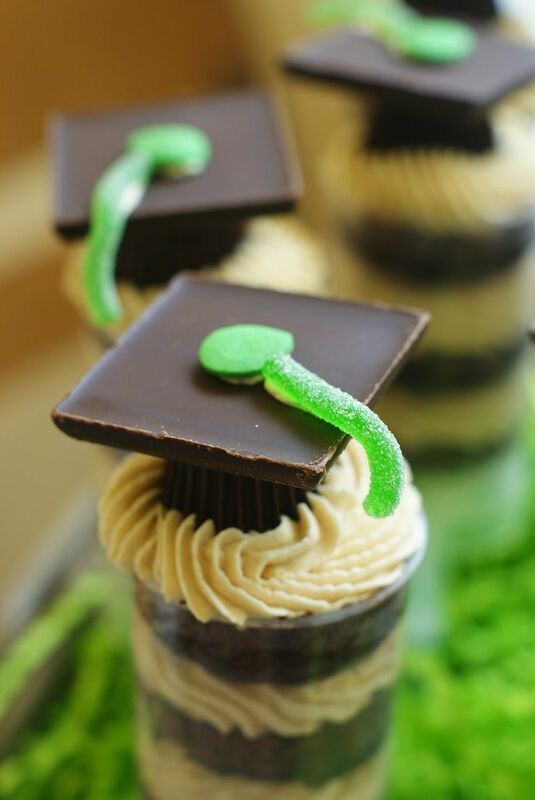 These are inspired by the *always* inspiring Bakerella and her graduation cap pops. place these in the refrigerator to set up while you assemble the pops. Assembling is easy. Press the push-pop container down onto the cake to cut to size. Slide the cake into the container (I used another push-pop "plunger," trimmed of its raised edges to press the cake down). 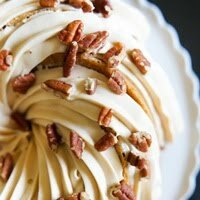 Use a paper towel to wipe away any crumbs before piping the frosting. 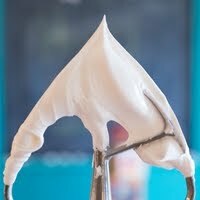 Pipe in some frosting. Keep adding layers until you reach the top. Add a graduation cap topper. Cute, huh? Now I just need to get inspired to use the other 88 containers in my guest room closet. 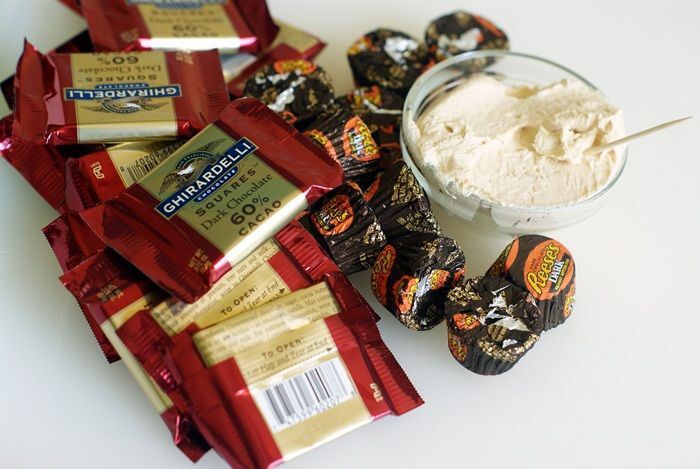 Beat together the butter, shortening, and peanut butter until combined, about 3 minutes. On low speed, add in the sifted powdered sugar in three additions, scraping down the sides and bottom of bowl as needed. 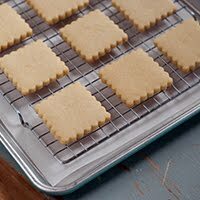 Once the sugar has been added, increase the mixer speed to medium-high and beat for 1 minute. Add in the vanilla and the milk; beat until smooth. These are so cool,love them! Bridget, I love these!! 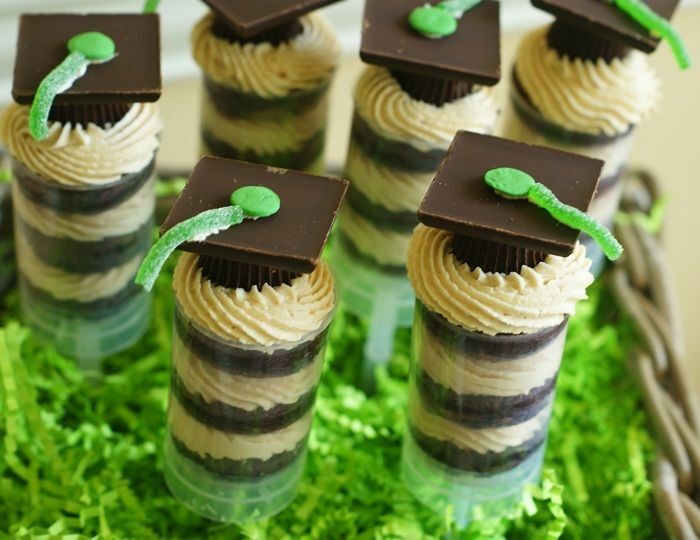 Easily the coolest graduation treats I've seen so far. You are such a rock star. That first picture is fantastic! Oh my god! That looks really good! Beautiful picture! This may seem silly, but how do you eat these without being messy??? 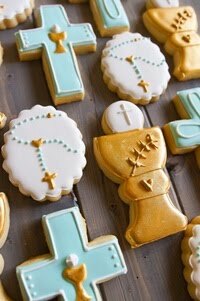 I've wanted to make these for different occasions at church but am afraid it will end up being too difficult for people to eat. I know, it worried me at first, too. You just eat it right off the top of the container. No worries at all. Beautiful!!!! You are just so amazing!!! These should be at every graduation, adorable!! I just LOVE peanut butter. These are so cute, and sound yummy! I just won some push pop containers in a giveaway, and the Push-up Pops book from another(hasn't arrived yet)! Can't wait to give it a go! These are the absolute cutest things ever. I was going to order some of these push pop containers, and then a little voice in my head said, "You will only use those like once and then they'll just take up space in the kitchen!" Oh! Una maravilla! Un trabajo estupendo! so cute, I want to try those so badly but the push pops cost about $1 here, yikes! these are so awesome! I just bought some push-up molds last week and put them to use but nothing as crazy good as these look! I may or may not have a portion of a closet dedicated to "future projects". In a NY city apartment, that's saying a lot. Wow...you are so creative! Where do you get the time to do all these incredible things? These are so cute! Thanks for sharing your creativity with us. I am equally obsessed with the push up pops! I have so many here I don't know what to do with! Well it was certainly worth the wait for you to use these push pop containers. 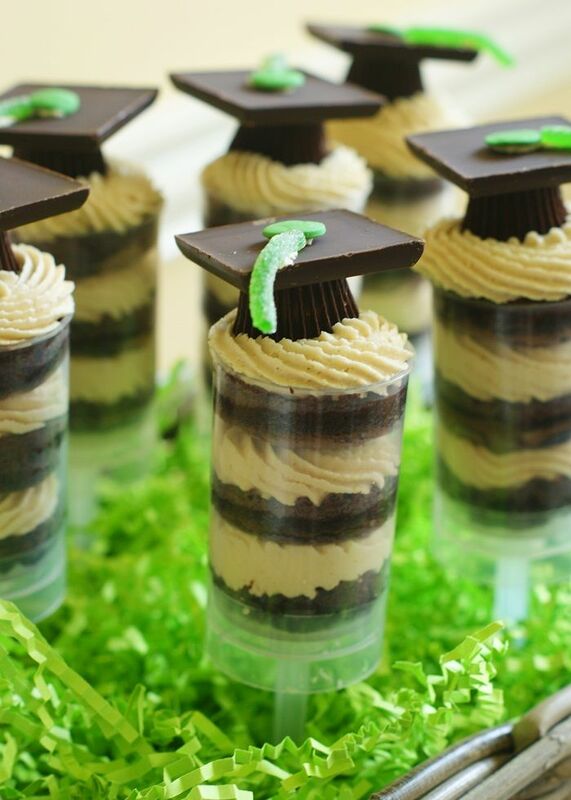 These are the cutest idea for a graduation treat. The push pops sound delicious but I'm loving the cuteness of the grad caps the most. Perfect!!! I may even be able to pull these off. You've had them for a year? LOL. You totally sound like me. I get a bee in my bonnet for things and jump in, buy a ton then forget. So glad you finally got around to using them, the graduation push pops are great, so creative. Love the green sour spaghetti on the top too! These are crazy adorable! Is it easy to eat without things getting messy? 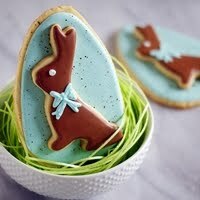 super cute && delicious. 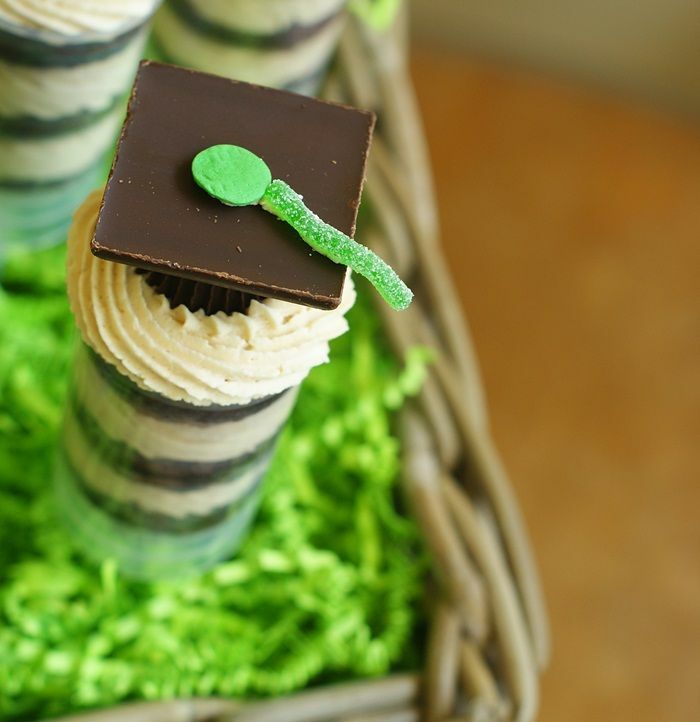 this would be a great party treat for an upcoming graduation party I've been helping bake items for!! wonderful as always! These are super cute! I've seen a few recipes lately with these push-up pops containers. They remind me of when I was a kid, and I'm thinking maybe I need some. These are adorable. Your creations always look picture perfect. I don't have that knack, so it would probably take me quite some time to put them together. 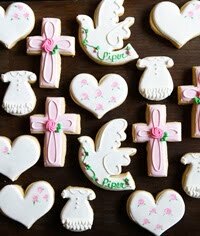 These are absolutely adorable! I need to buy some push-up molds! These are awesome! I love the push up pops, but it's the little grad caps that I really love!! So pretty! 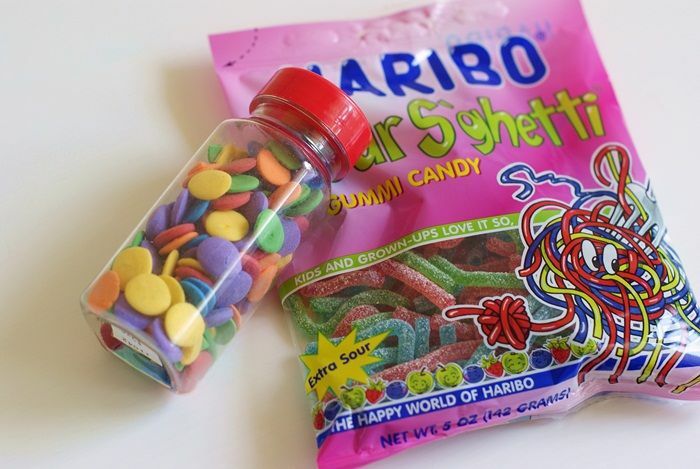 I'd love to graduate again so that I'd have these for treats...Yummy! How adorable are these cake pops! 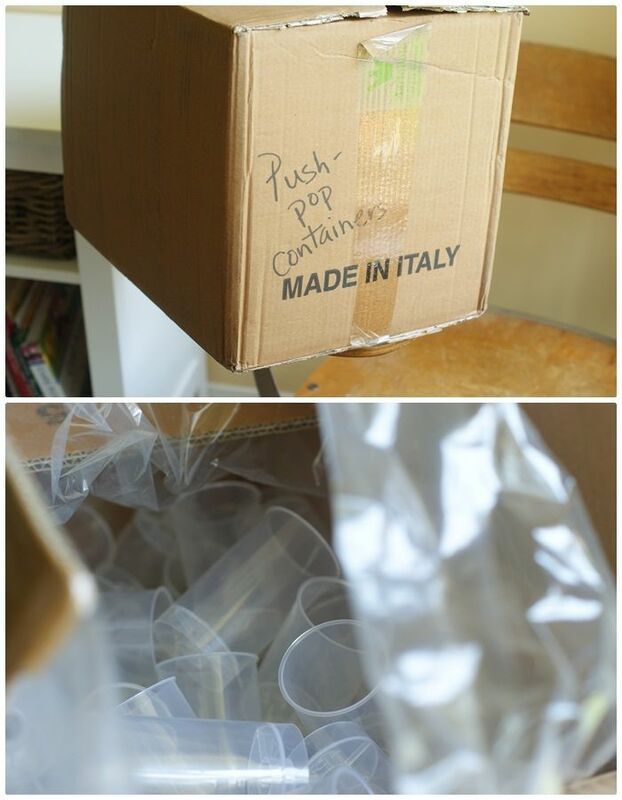 Better keep those push~pop containers handy! I absolutely LOVE push pops! These are really cute. I was so excited when i first saw the push pop containers that my hubby ordered 4 dozen for me..that's been well over a year. Maybe one day I can come up with an idea for them. Yours are GREAT! These are great!! And I love to read about other people's obsessions - I, too, have jumped into a project only to let it sit in a box for a looong time....Sometimes the thought of doing something is so much more exciting than actually doing it, but in this case, these are beautiful! 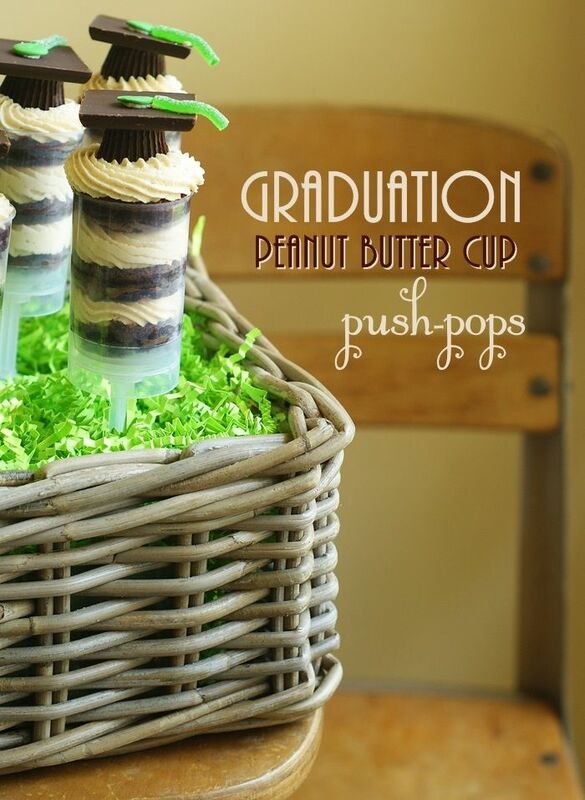 If you submitted your Graduation Peanut Butter Cup Push-Pops photos to http://www.foodporn.net , I'll bet they will make you on the home page. you can send the other 88 to me! These are just darling! You are so creative! I am in love with these. 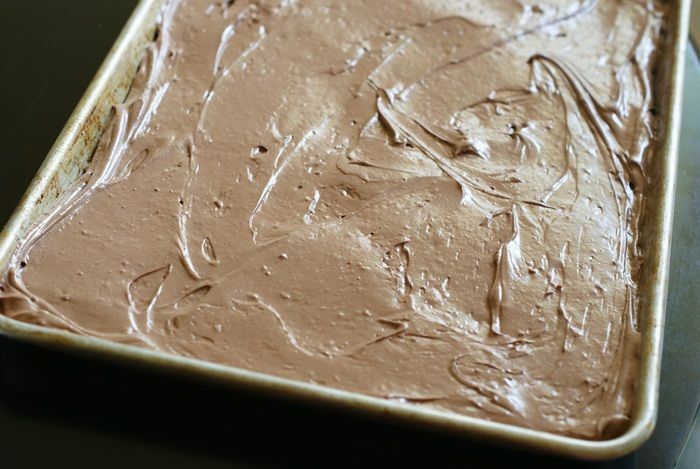 Please post the chocolate cake recipe and how you made it so flat and even.